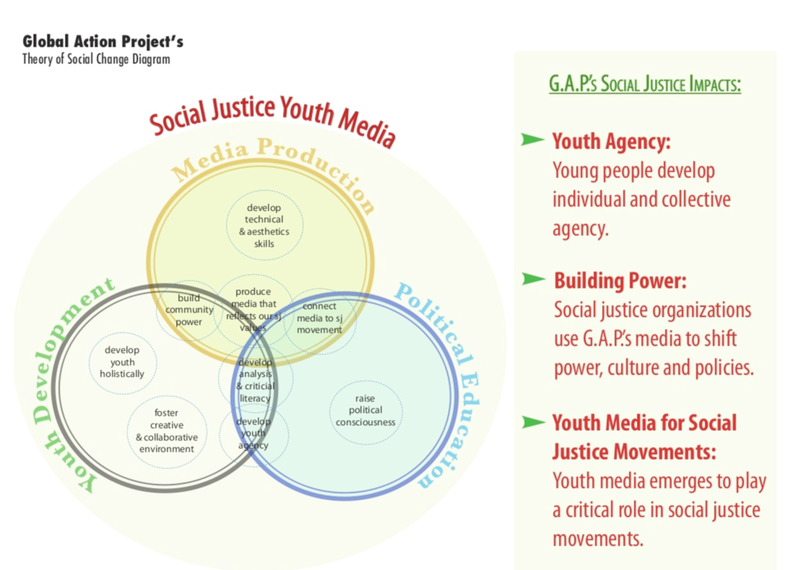 Global Action Project (GAP) develops the capacities and skills of youth most affected by injustice, to create powerful media, cultural expression, and social change. GAP provides effective media-arts programming to youth from low-income, new immigrant, and TLGBQ (Transgender, Lesbian, Gay, Bi, Queer) communities. Since its founding in 1991, GAP has fostered a pipeline of socially conscious, media-savvy leaders of the future. Working with professionally trained artist-educators, youth collaborate to make powerful narrative, non-fiction, and new media pieces that amplify their diverse stories, and then use that media to educate and advocate on behalf of their respective communities. GAP’s award-winning media production, analysis and popular education curriculum is widely respected and has been adopted and used by hundreds of organizations and educators. To date, GAP has created over 200 award-winning and critically-acclaimed videos on a range of crucial topics (such as the school-to-prison pipeline, TLGBQ youth homelessness, immigrant rights, and the policing of youth of color), and trained thousands of youth media organizers in a broad cross-section of social justice movements. Our work regularly garners international attention and national awards, as well as acceptance into festivals worldwide. The New York State Council on the Arts deemed GAP a “primary institution,” honoring our unparalleled cultural contribution to the state; and in 2010, GAP was honored at the White House with the prestigious National Arts and Humanities Youth Program Award, this nation’s highest honor for out-of-school arts and humanities programs. Developing a new generation of visionary media activists and youth leaders who bring an intersectional analysis of structures of oppression and are versed in the many ways we organize for social change. Providing in-depth media literacy & production skills, allowing young people who are most impacted by social and economic inequality to create powerful counter narratives through short documentary, narrative, and new media work. Supporting youth-led community engagement and organizing efforts through: a) partnerships with community organizing groups, coalitions and campaigns; b) youth-led screenings, workshops, and trainings, where youth insert their creative voices into the public discourse and spark community responses to social justice issues; and c) youth media capacity-building and campaign support for organizations across the country. Global Action Project celebrated its 25th anniversary in 2016! This video highlights the model that has made GAP groundbreaking in linking youth development, media production, and social activism.